The Carte de Visite album passed down from Mary Fleming (nee Lamb) has been a wonderful example of an early photograph collection to work on. This collection dates from the late 1850’s to the 1870’s, spanning the period of great popularity of the format for collections of celebrity pictures, exchanging with friends and acquaintances in place of the visiting card and family keepsakes. I have established the connection between the Fleming and Stanley families. In the 1868 London Post Office Directory’s Court section, Charles James Fox Stanley is listed at 9 & 10 Half Moon Street, the address of Flemings Hotel. 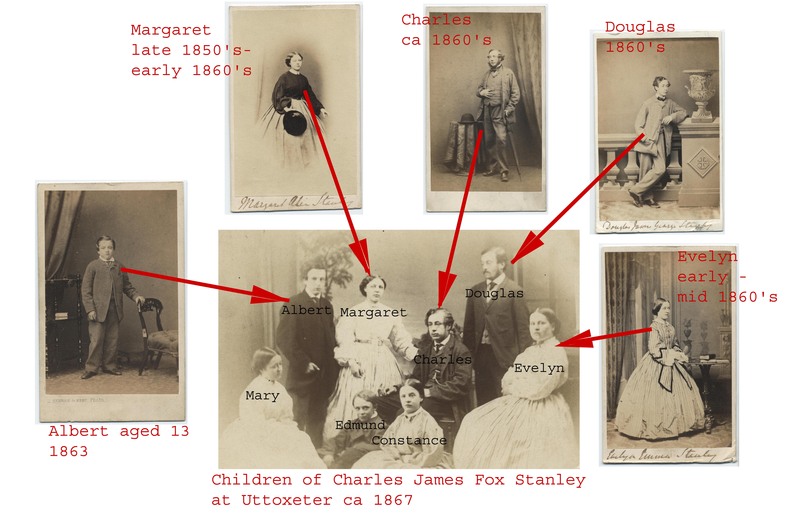 The four photos annotated with names Stanleys: Evelyn Emma, Margaret Alice, Douglas James George and Albert Hamilton are all consistent with being those members of the Stanley family, children of Charles James Fox Stanley, 3rd son of the 13th Earl of Derby. I dated the photos based on costume, props and records of the photographer’s activities found in census, newspapers and trade directories, estimated the ages of the subjects and calculated which Stanley family members could be represented in the album. The Stanley family were resident at Loxley Hall, near Uttoxeter in 1871. The group photo portraying eight people was taken by T B Allport of Uttoxeter. Then I compared the faces, eliminating bias by presenting pairs of faces to a sample of genealogists, friends and family, and using Picasa to compare faces. As I expected people performed better than the computer software. These techniques provided supporting evidence for the identity of some Stanley family members, but sadly disproved my hopes of finding one of the Earls of Derby in the album. What a wonderful collage of photos! Excellent.